Fall of Magic back in stock! Fall of Magic is officially back in stock! Grab your copy here. 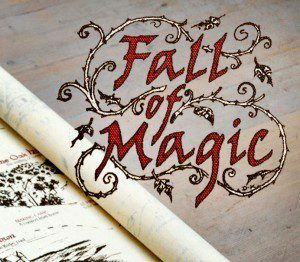 We are currently out of stock of all editions of Fall of Magic except French. We will have another 30-40 english available sometime this week. 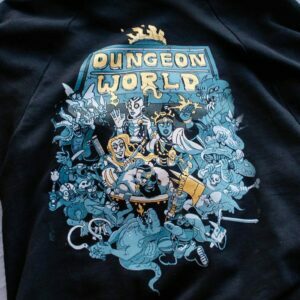 After that we will be out till we get a reprint done sometime early 2018. Have you ever had an experience that felt inexplicably sacred, where space was being beautifully held, but you didn’t fully understand why? Recent articles like “Season of The Witch: Why Young Women are Flocking to the Ancient Craft, ” have been circulated, liked, and shared in high frequency, along with other internet and “IRL” spaces engaging in similar dialogues, and it’s all connected to a larger conversation surrounding access to ritual and self-care. As huge shifts in the cultural dialogue of power and oppression are happening, the importance of solace and grounding deepens. 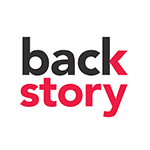 People can look for this not only in connecting to their deeper selves and values, but also to personal and collective stories and experiences. The question is; how can the space be created that is necessary for these stories to be told? The sensation is familiar, it’s the struggle to integrate an intuition or a ‘feeling’ with a practice. For many people, and particularly millennials, accessing these parts of ourselves can be confusing. 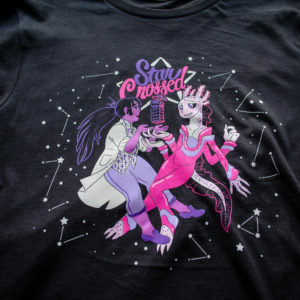 It’s difficult to separate from that highly simulated, televised experience; a character casts a spell and you see something change before your eyes, to make room for a more nuanced perspective and understanding of what that looks like. 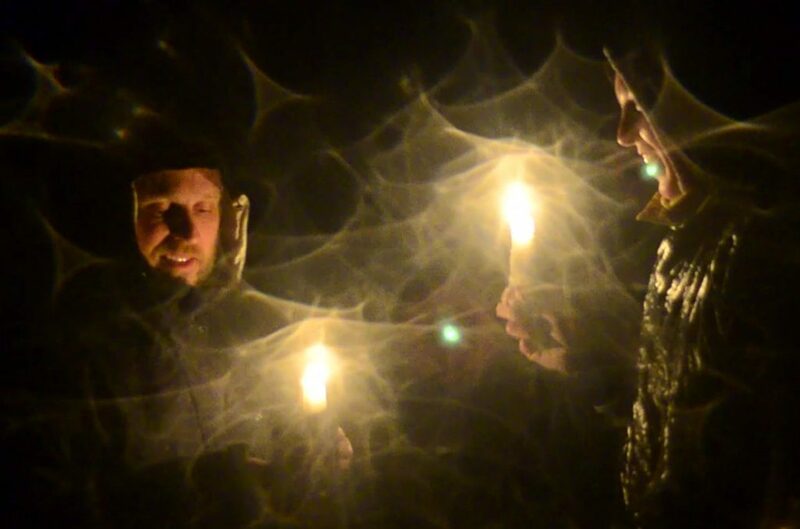 Creating ritual and the actual practice of magic, while felt, can be unclear. 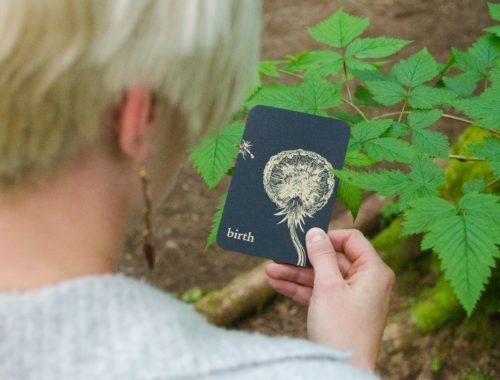 “I think many people have the experience of being in facilitated space, but may not know how to hold that space or how to facilitate ritual for themselves and others ,” says Mo Golden, co-creator of the ritual game Night Forest. 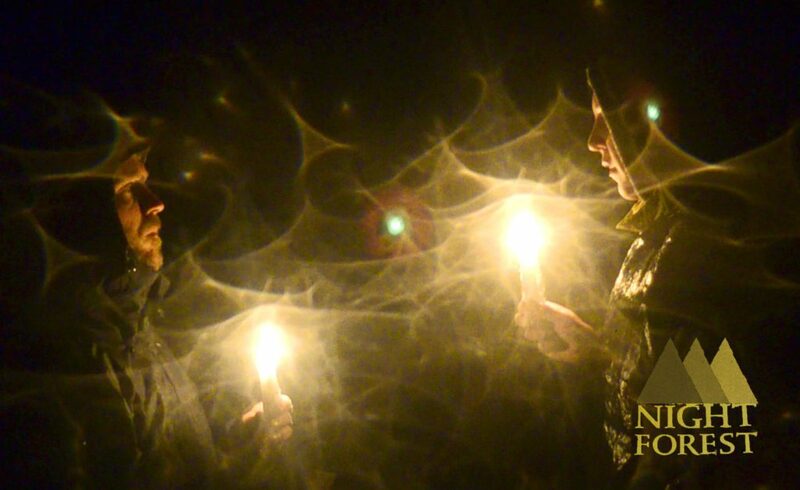 Night Forest was designed and produced by Mo Golden and Ross Cowman with a team of collaborators in Olympia, Washington, and it focuses on the practice of listening to and sharing memories. 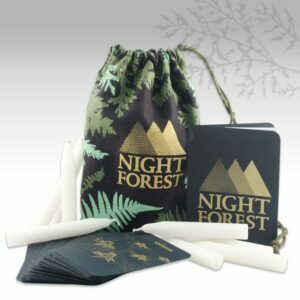 In Night Forest, described by the designers as “a ritual game of memory, embodiment and self-discovery ,” people play a group of “memories.” At the start of the game, each player gets a candle, a book of matches and a card. At a chosen location; like the forest, a field, or an abandoned building, the group disperses. When you’re alone, you light your candle and look at your card. Each card is accompanied by an illustration and a word, which you use to recall or inspire a memory. “You let it appear, change and shape-shift a bit ” as you’re moving through space, until you come into contact with another player. At this point, each person stops and takes turns exchanging memories. After each player is finished, they trade cards and continue the journey. It’s a practice of deep listening, witness and communion. Maenna Welti, a self-described “witch, astrologer, tarot reader, musician, writer and feminist ,” speaks to this idea of pragmatism further. In her Healing Wheel Workbook, she suggests “magic is energy plus intention .” When we deconstruct it as such, magic and ritual become much more tangible and accessible. It’s a shift in the understanding of magic as something that exists outside of us to viewing it as a power that we already contain. The practice is how we harness it. 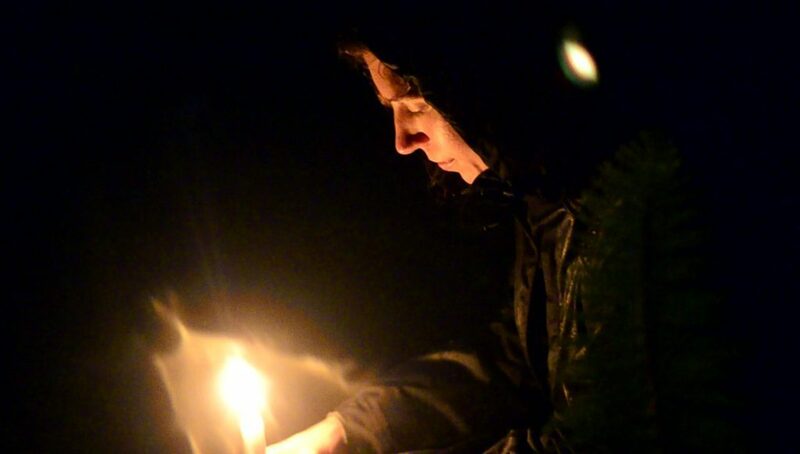 “While we have many tools such as Astrology or Tarot to connect us to ritual or divination, these practices are often solitary or focused on one individual. I think the challenge and necessity is how to create and hold that space with other people. Night Forest is very balanced, fluid, opening up the channels so we all have space to be seen… it’s a tool to cut through the social veil and cultivate intimacy .” Mo states. This type of engagement with one another becomes particularly important as we face a resurgence of cultural, political and personal tensions. Much of the work we are being called to do requires connection and community, and the dissolution of physical and metaphorical ‘walls’ is a necessary component of getting there. The reality is, ritual and intention aren’t necessarily things that are natural facets of how our society operates. Creating human contact and bridging gaps isn’t a ‘given’ when it comes to moving through the world with others, and neither is taking care of ourselves. People have to create and facilitate these practices for them to flourish. Ultimately, each person is already powerful just as they are. The ability to access ritual and act with intention already exists within, from the materiality of who we are and what we intrinsically know and have to offer. 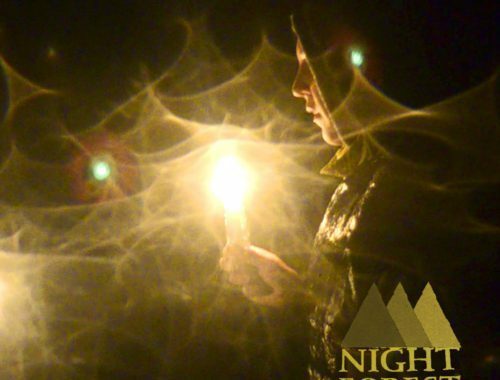 Night Forest simply acts as a tool to facilitate that exchange and create the container for the collective experience. Doyle, Sady. “Season of the witch: why young women are flocking to the ancient craft.” The Guardian . N.p., 24 Feb. 2015. Web. 5 Apr. 2017. Maeanna Welti: Tarot, Astrology, Magical Life Coaching. N.p., n.d. Web. 13 Apr. 2017. “Night Forest with Ross and Mo.” Personal interview. 6 Apr. 2017. Welti, Maeanna . Healing Wheel: A Samhain to Samhain Workbook. Olympia: n.p., WA. Print. 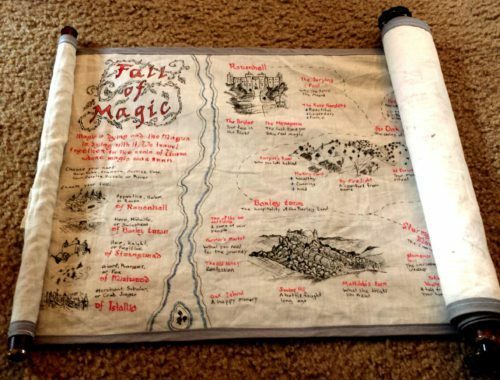 If you’re planning to order Fall of Magic for someone as a Christmas present, you have till the end of the day Monday to place your order for Christmas delivery. This is a series of videos recorded at the Fall of Magic prerelease event last winter. Two of the videos are from the designer presentation and Q&A featuring myself, Doug Keith, Taylor Dow, and Jackson Tegu. The other video is footage from the play sessions that followed the presentation. I hope you enjoy this taste of the prerelease event! Hello backers! 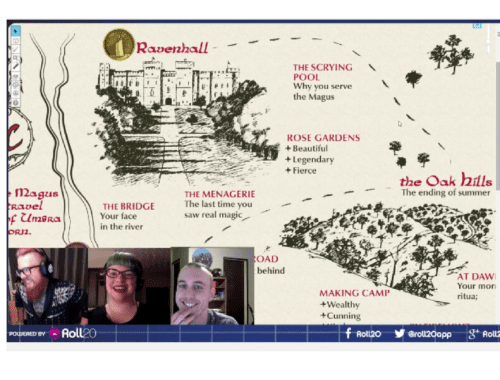 So glad you’ve gotten to play Fall of Magic on Roll20.net, hope you’re enjoying it. I’ve really enjoyed the stories, quotes, and screenshots some of you have shared so far. It’s so cool to see how different each game is and all the amazing possibilities people have come up with. Feel free to share quotes from your game or a recap of what happened in your campaign! I read a list of best RPGs of 2015 and saw Fall of Magic on it. The write-up intrigued me, so I checked it out, got excited, needed to own it, wanted the scroll, checked my finances, bought the electronic version instead because I didn’t have the $75 to spend. 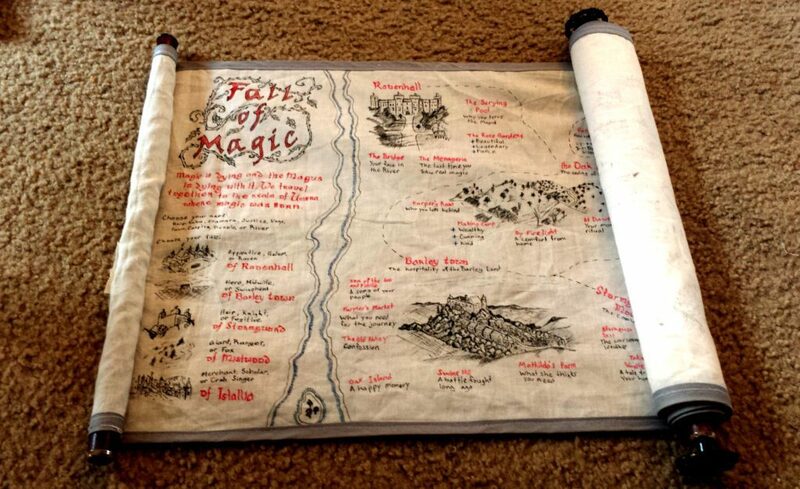 I love the game, but wanted to play the game with the same evocative feel the scroll provides rather than printed out sheets of paper. So I made my own. Spent days staining wood, sketching on linen trying to recreate your work and Doug Keith’s art. 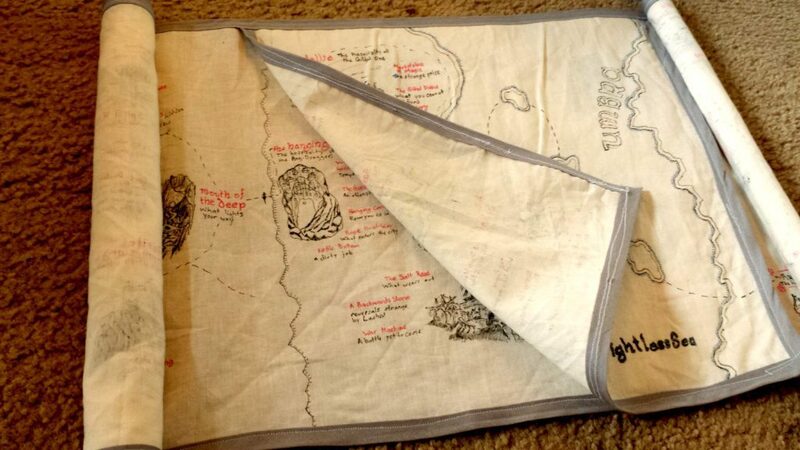 Learning to sew to put that gray trim on to keep the cloth from unraveling. In the end, I’m pretty pleased with it. It isn’t as gorgeous as the version you produce, and it definitely doesn’t have those wonderful tokens, but I worked hard on it and I’m proud of it. Ross’s new game – Night Forest – is expected to launch on Kickstarter this Fall. It is a live action game, co-developed and beautifully illustrated by artist Mo Golden. To play, you find a few friends, candles, matches (careful now kids), and head for the woods (or a park, for those who don’t live in misty Olympia, where this game was first conceived). As you wander alone with your lit candle, you have an illustrated card with an evocative prompt that you use as inspiration to remember or invent a memory. As the memory comes to life through your movement, you encounter other walking memories in the darkness. You approach one another, share your memories, exchange cards, and venture off again into the darkness. The game’s structure evokes deep introspection and compassion for other players, while also inviting players to explore their experience of being alone and in the company of others. 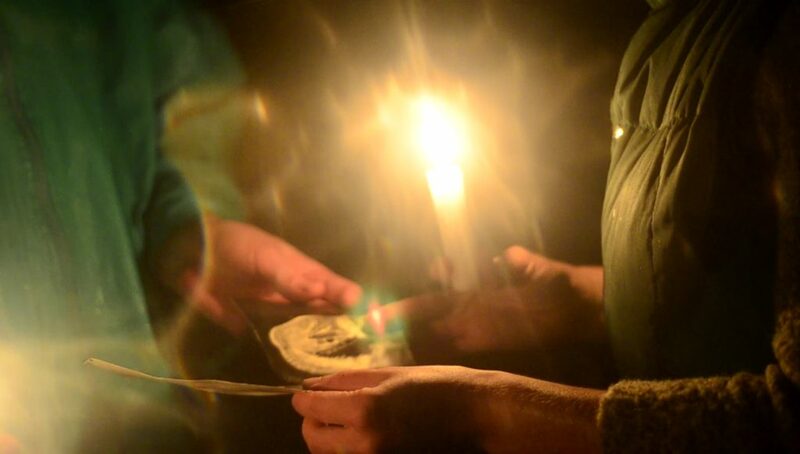 The prompts offer players the possibility to truly take the game in whatever direction they want, and players are often surprised at what memories come alive for them as they walk, card in hand, through the candle-lit night forest. Want to get notified once Night Forest is live on Kickstarter? 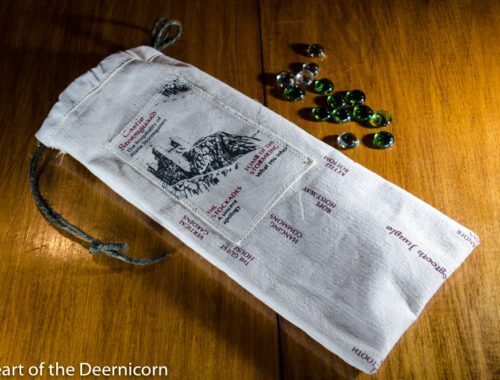 Sign up here and you’ll get Heart of the Deernicorn game updates. Don’t get too excited though… the emails only go out about every 3 months. Also, if you’re headed to BigBadCon, there’s a chance you could play a prototype version of Night Forest… maybe in a parking lot.